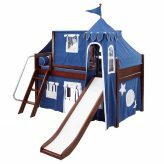 What could be more fun than wood loft beds with slide & tent? 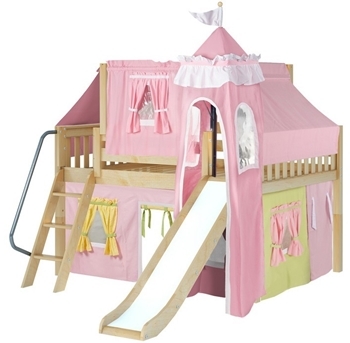 The best loft beds for kids are tent lofts. 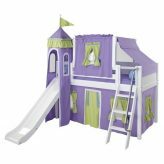 Younger children love imaginary play so a princess loft bed with slide or a castle loft bed will please any young boy or girl. 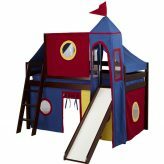 Whether you need a twin loft bed with slide or more sleeping space in a full loft bed with tent, you will find it here. Our tent loft beds are extra sturdy supporting weights up to 400 lbs. 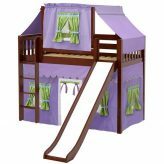 They are made of solid wood with added safety features such as wide rungs on the ladders and a hand rail. 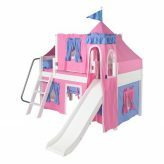 The fact that they can be reinvented into single beds, bunk beds, or more and matching case goods complete your kids bedroom. 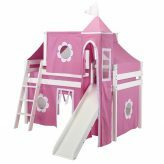 Please your princess with wood loft beds with slide & tent!